Earlier this year the collaboration between the three brands was leaked and had many anticipating the release date. Now, we finally have official word from adidas that the pack of two silhouettes will arrive later this month. 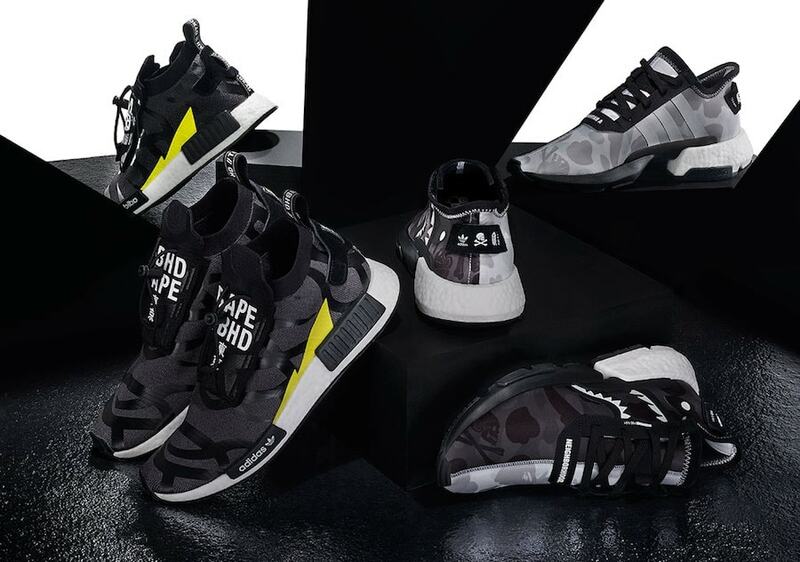 adidas has been known to work with Bape and NBHD as they have multiple collaborations under their belt with each. 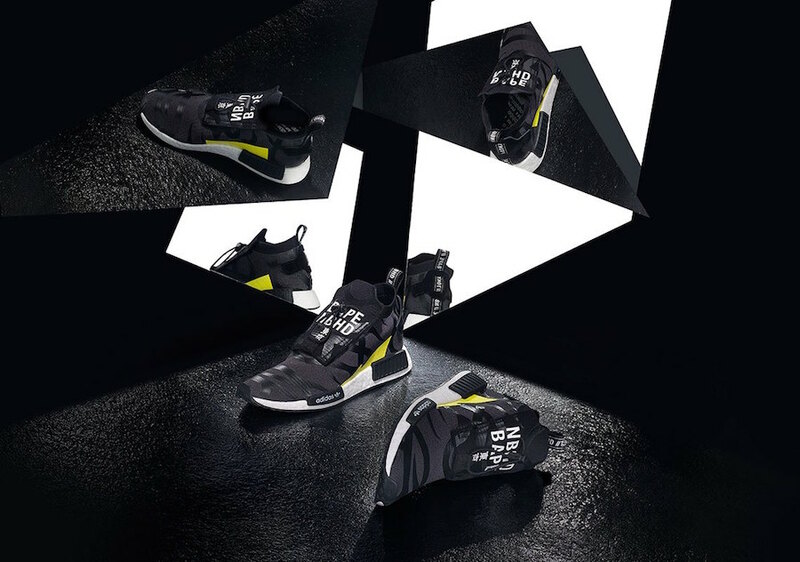 This time around, the two Japanese brands join up with adidas at the same time for two different models: the POD-S3.1 and an NMD STLT. Finally, after months of waiting, the two will be releasing very soon for your springtime needs. adidas’ POD system has not been around for very long as it is a pretty new silhouette. A collaboration with two well-known brands can do the model well and get it the momentum it needs to find success. The upper is divided directly in the middle with black making up the medial portion and white taking over the lateral side. The famous Bape camo then covers the entire shoe with an added feature of the NBHD skull and crossbones scattered throughout. More branding can be found on the heel tab as all three of the brands’ logos pop in white. 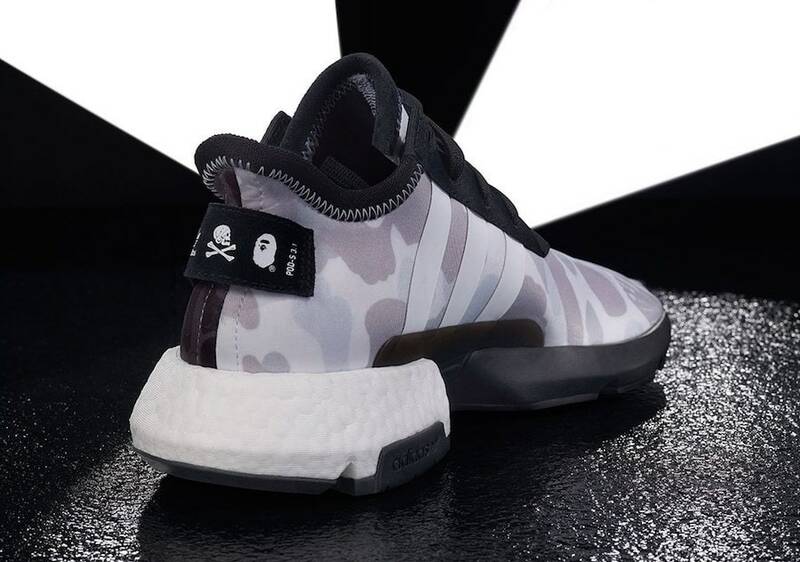 Continuing, the Bape shark teeth and eyes take on the lateral sides of the shoe, while adidas’ Three Stripes branding take on the medial side. To finish it off, the midsole is divided into half, white boost on the heel section and black rubber towards the toes. 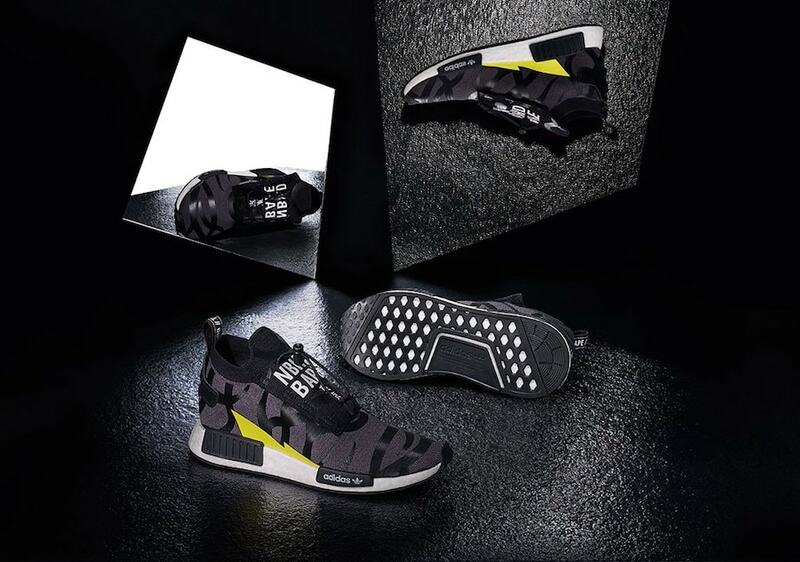 The second model used is adidas’ reworked version of the NMD, the NMD STLT. The upper consists of a dark grey primeknit that has overlays of a wave black pattern. To add a vibrant pop of color, a neon yellow lighting bolt overlay adorns the midfoot. 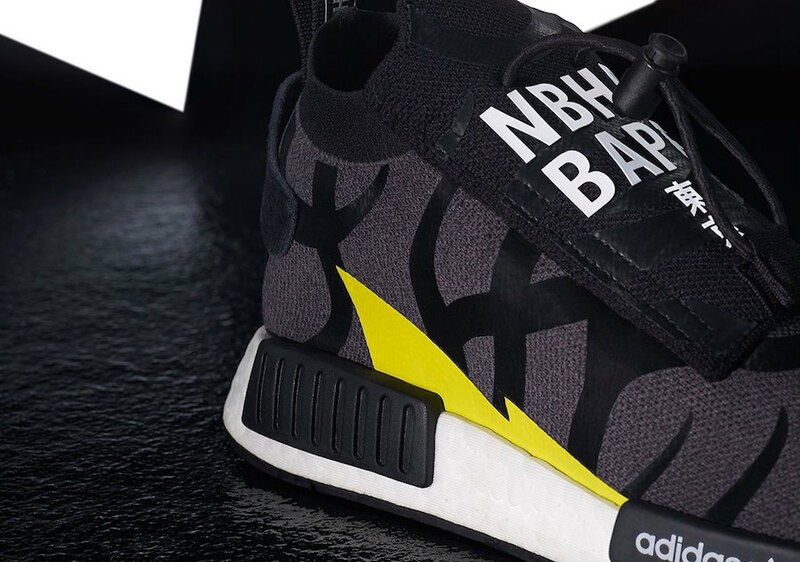 Bape and NBHD branding with “Tokyo” written in Kanji are then placed on the tongue shroud that houses the toggle lacing system that defines the silhouette. As usual, the sneaker sits on an all-white Boost midsole that is accompanied with black color blocking. 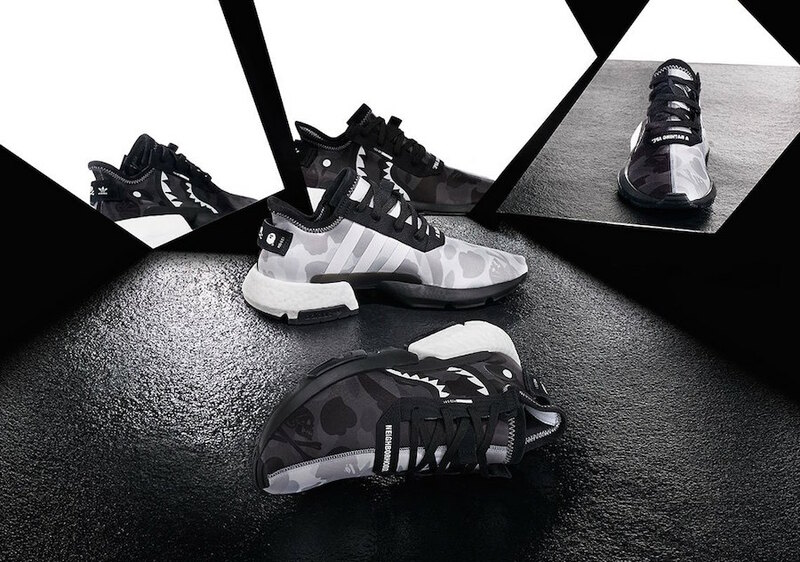 Finally, the shoes have an official release date of April 19th, 2019 for a retail price of $200 each and will be released at select retailers and adidas.com. If you’re looking to pick up a pair of either one, do not hesitate as they will likely be released in limited number and sell out fast. 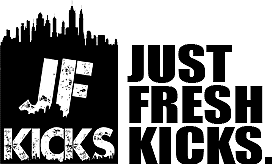 Check out more detailed pictures below and as always stay tuned to JustFreshKicks for more adidas news.